﻿﻿Trophy Time Fish Reproductions is located just north of Pequot Lakes, MN. 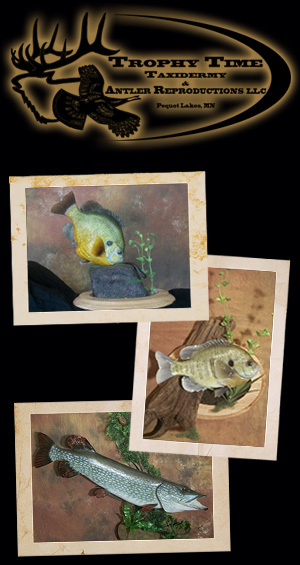 At Trophy Time, fish are molded from fresh fish, which in turn creates the most realistic fish replicas available today. If you’re looking for a fish reproduction, we can either mold your fish for $11.00 per inch or create one with one of our molds for $16.00 per inch. There is a $165.00 minimum charge. If you catch a fish you’re going to release then get a length, weight and a picture ( but not necessary ) before releasing your fish and either bring in the info or send us an email with all the details to get things started. Ordering: Our fish replicas as stated above are $11.00 per inch with your fish or $16.00 per inch with our molds. Delivery times vary slightly throughout the year but most replicas are completed within 70 days. Any habitat such as rocks, driftwood, weeds or scenic panels are all an extra charge. Whether you’re preserving a memory or just wanting to decorate your home, cabin, lodge or office, let Trophy Time Fish Reproductions help you with all your reproduction needs. Reasons for getting reproductions made instead of skin mounts. 1) Replicas are very durable and can withstand the different seasons, unlike skin mounts where the skin can shrink and have cracks. 2) Scales can lift during the mounting process creating a not so desirable mount. 3) Skin mounts dry down after the mounting process, which causes shrinking in certain areas and all these areas need to be rebuild with apoxies prior to painting. 4) Skin mounts are only as good as the person mounting the fish and even so it cannot get done perfect unlike a repo that is cast off the real fish giving you every detail the fish has. 5) Replicas will never give off an odor.